Cruises are becoming increasingly popular over time, with greater numbers of people seeing the benefits of taking a cruise over a traditional vacation. Cruises allow you to sit back, relax, and simply ‘go with the flow’ in a very literal sense. The crew will take care of everything, transporting you wherever you need to go, as well as providing you with amazing accommodation, awesome dining, and excellent entertainment features and facilities all over the ship. Scientists say that January is the most depressing month of the year, so it’s one of the best months of the year to get away from the boring, miserable monotony of daily life and enjoy some new, exciting, and adventurous on board a luxury cruise ship. There’s no way you can feel down when you’re surrounded by so much excitement and enjoyment, with lots of wonderful destinations just waiting to be explored. Read on to learn a little more about some of the best cruises to take in January and start planning your fantasy cruise getaway today. If you're planning a cruise in January, there's a good chance you'll want to visit the Caribbean Islands, and that's exactly what this '8 Night Southern Caribbean' cruise from Carnival can provide. The Caribbean is an excellent destination in January as it's so warm and sunny around the Caribbean islands at all times, meaning you can flee from the frosty conditions of your own hometown and enjoy some fun in the sun with your friends, family, and fellow travelers. This January Caribbean cruise sets off from Miami in Florida and makes a total of four stops over the course of its journey. For this cruise, you'll be able to travel on board the amazing Carnival Horizon. Voted as one of the best new cruise ships out there, the Horizon is only a recent addition to the Carnival fleet but really stands out for its immense size, stunning interior decoration, and awesome array of amenities. With multiple pools, bars, lounges, restaurants, and more, this ship has everything you'll need to have a good time and even offers amazing unique features like a SkyRide track, an IMAX theater, a Dr Seuss water park, and much more. 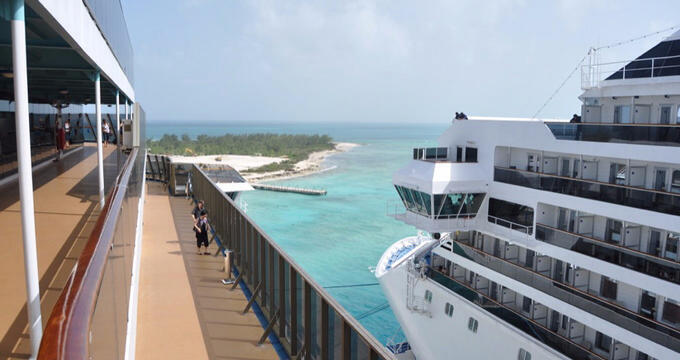 The first stop will be at Grand Turk Island in the Turks and Caicos Islands. There, you'll be able to enjoy some authentic Caribbean cuisine and relax on some soft white sands before heading back on the ship and setting off for stop number two: La Romana in the Dominican Republic. A beautiful beach and snorkeling spot, La Romana is also closely linked ot Altos de Chavon, a nearby village stylized to look like a 16th century Mediterranean location with lots of colorful achitecture and artists' galleries. The last two stops of this January cruise will be at Willemstad in Curacao and Orangejstad in Aruba, two more amazing destinations with white sands, turquoise waters, and lots to do. The Caribbean tends to be one of the top cruise destinations for January, but there are plenty of other beautiful places to explore at this time of year as well, including the warm and sunny waters of Mexico. This '7 Night Mexican Riviera' cruise from Norwegian Cruise Line runs in January and is an excellent option for passengers of all ages, making multiple stops all around the Mexican coastline. For this amazing cruise, you'll be welcomed on board the Norwegian Joy, which is actually one of the latest and greatest additions to the Norwegian Cruise Line fleet. Joy is exactly what you'll be feeling every single time you wake up aboard this astounding cruise ship and roam its beautiful rooms and corridors. The Joy is fitted out with a wealth of features and amenities to make every journey as enjoyable as possible, including multiple dining options, lots of live entertainment, and plenty of activities to check out too. For this January cruise, you'll be setting off from the port of San Pedro in Los Angeles, so this is a great option for anyone over on the West Coast or those who can get to LA quite easily. The cruise lasts a full week and makes its first stop in Cabo San Lucas, home to some romantic shoreline destinations like the Lovers Beach. Next, you'll visit Mazatlan, the popular beach resort city that has been a major cruise destination for many years. Finally, your third and last stop will be at Puerto Vallarta, a popular party spot that also has some excellent water sport and snorkeling areas to enjoy. If you've got a little extra time to spare and the money to go along with it for a longer and more fully-featured January cruise, this '15 Night Hawaiian Islands' is one of the most amazing options out there. A new year will have just begun, and there's no better way to celebrate the occasion than by taking this extraordinary January cruise all around the islands of the Aloha State itself. This cruise sets off from San Pedro in California and makes a total of five stops all around Hawaii. For this cruise, you'll be warmly welcomed on board the wonderful Star Princess. A very highly rated cruise ship with a lot to offer, the Star Princess has received a lot of positive reviews from previous passengers for its staff. The crew members on board this ship really make huge efforts to ensure that every guest has an amazing time, and they'll definitely go above and beyond the call of duty to make your journey as great as it can possibly be. The ship is also fitted out with a wealth of amenities and features, including lots of live entertainment, bars, lounges, and restaurants. As previously mentioned, this cruise sets off from San Pedro in the LA area of California and makes its first stop at Hilo on the Big Island of Hawaii. Local attractions at Hilo include the Panaewa Rainforest Zoo, the Hawaii Volcanoes National Park, the Hawaii Tropical Botanical Garden, and the stunning Rainbow Falls. Next, your second January cruise stop will be the Hawaii capital city of Honolulu, where you can check out some of the best beaches and most lively bars, clubs, restaurants, and attractions in all of Hawaii. Your third stop will be at Nawiliwili to let you explore the island of Kauai, before the fourth stop will let you explore Maui. Finally, the trip will make one final stop in Ensenada, Mexico, offering something a little different before everyone heads home.